There are two prevalent ecological paradigms guiding the way into the 21st century. The first paradigm, based upon the industrial model of supply and demand, views the earth as the sole source of supply for an ever growing demand for products to satisfy human needs and wants, both real and imagined. Because the economic structure that drives this system is based upon never-ending growth, the logical consequence is the exponential drain on the earth’s finite resources. To slow this inevitable outcome, unnatural manipulation of the earth’s resources have been devised to meet the growing demand. This manipulation threatens the future extinction of numerous species and has contributed to the 75% loss of the genetic diversity of agricultural crops in the 20th century. Recognizing the intrinsic value of all the Earth’s inhabitants, the other paradigm offers a much more sustainable future scenario where neohumanist values and diversity are encouraged, not destroyed. Agroecology is woven into this values-centered paradigm through its holistic approach to linking ecology, culture, economics and society to sustain agricultural production, healthy environments and viable food and farming communities. Our approach to desertification and environmental challenges center on community building. 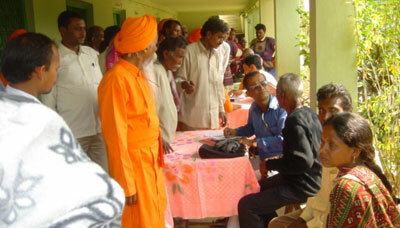 Beneficiaries become participants when involved in the planning, implementation and maintenance of projects. Beyond the social sphere, our physical efforts are rooted much in water regeneration and improving soil integrity. In addition to indigenous methods of crop production, we encourage modern elements of agroforestry, permaculture and crop rotation systems that increase crop yields and soil fertility. It has been shown that organic systems outperform conventional ones, especially in drought-like conditions. Our watershed management techniques employ the use of check dams, boulis, demi lunes, cordons pierreux and contouring for maximum groundwater recharge. The effects of desertification are being felt in villages throughout the Sahel, where groundwater is fast disappearing. During the long dry season, people hand dig wells in naturally formed channels in an attempt to fulfil both household and animal needs. Many of these wells and bore holes have dried up as the underground water table is being consumed faster than it regenerates. Accessing clean water is a daily struggle in the Sahel. Though, when it rains, it pours! During the short wet season, rains are extremely heavy. With flash flooding, comes erosion and loss of top soil. The seemingly abundant rains in this season offer an interesting contrast to acute water shortages in the dry season. The question becomes – how to best capture and utilize the water that does grace this region? A bouli is a traditional type of earthen dam used to collect flood water during the brief rainy season. They are installed at strategic points within water channels. Water collected is normally utilized for household needs, irrigation and cattle during the long dry season. A mini oasis, boulis naturally attract various species of plants, insects and animals. Located 6km from Deou, the village of Ayagorou is home to two boulis. AMURT partnered with the community to build, and later expand, the boulis there. The main bouli collects and holds nearly 12,000 cubic meters of water. Its primary purpose is to provide 35 families with irrigation for off-season vegetable gardens, which help to improve nutrition and provide an additional source of income. Families there have also planted over 1,000 nitrogen fixing and fruit bearing trees around the perimeter, further promoting biodiversity. The smaller bouli, just adjacent to the main one, is used to provide drinking water for livestock during the dry season. Gabions are wire mesh cages filled with stones. They are generally stacked and connected to make check dams, that are installed water channels. This low cost technology is extremely effective in slowing flash flood runoff, preventing erosion and recharging groundwater. AMURT helped to establish the first gabion production site in the Deou area. Manufacturing gabions locally allows for better access and additional source of income for farmers. AMURT provides technical advice and support to communities wishing to employ the use of gabions. AMURT was invited to Kindikombou village, in the far east of Burkina Faso, to assist farmers increase yields and profits. Although the men initiated the relationship with AMURT, the women have benefited the most with the revival of two long dormant women’s associations. Now, every day they meet in their vegetable gardens, proudly caring for their egg-plants, tomatoes, onions, cabbages, lettuce and squash, and enjoying the company of other women free from the demands of their husbands. The women have fully embraced sustainable farming techniques. Each member brings manure, ashes, leaves, weeds, or food scraps until they have a large enough pile that produces compost rapidly in the burning sun. They also make their own insecticides using dried neem seeds and hot peppers. They love these methods because they are free! The women sell their vegetables at the weekly market and whenever customers show up at their gardens. With every sale, they celebrate their growing economic independence and self-reliance. AMURT is helping the men diversify their current cash crop production, limited mostly to cotton, by introducing organic sesame and organic soya. Not only do these new crops enjoy guaranteed markets, they also have short growing seasons, need little or no fertilizer, and fix nitrogen in the soil. The Burkina Faso government is in the process of establishing organic standards for farms, so the next step will be to help the farmers get certified and train them in organic farming. AMURT will serve both as a liaison for the farmers’ associations, linking them to larger markets, and as a technical support. Communities worldwide need functional examples of sustainable practices. 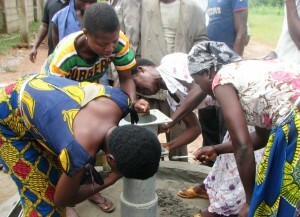 AMURT is facilitating the creation of such village-based models. One of these models is located in Bissiri village, just 60 kilometers from the capital, Ouagadougou. The farm demonstrates sustainable technologies such as agroforestry, crop rotation, integrated pest management, composting and live fencing. These technologies are attracting the attention of local farmers, impressed by our abundant, chemical-free harvests. We use insecticides made from neem and pepper, and plant catch crops such as herbs and flowers to attract beneficial predator insects that attack enemy insects. The local community is beginning to realize that their farming practices need to change. Chemical pollutants from their vegetable farms are contaminating the nearby lake, the main source of household water for the community. Given this new risk to their health, local people are beginning to seek viable alternatives. Another objective of the project is to popularize the consumption of organic produce in Ouagadougou. This move has exceeded expectations, with the demand surpassing production capacity. The four weekly deliveries of organic fruits and vegetables, including eggplant, lettuce, squash, radishes, drumstick, tangelos and papayas, are snapped up by eager customers. The Bissiri model farm is also beginning to produce value-added products such as moringa powder, medicinal herbs, honey and juice.